Yourselves, after a short training session. Why not take the challenge and discover the city’s most beautiful quarters and all they have to offer. 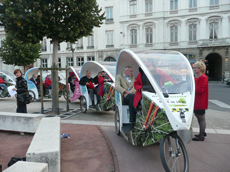 After an information session at Place des Terreaux during which you’ll be given your log book, maps, badges etc., the teams will set off on their urban cyclo taxi adventure and treasure hunt. With the help of your road book you will discover historical anecdotes and be asked observational questions in reference to these details. At various ‘check points’ along the way there will be tastings to enable you to try various Lyonnais specialties. The tour ends at a wine cellar, where you can discuss your experience and exchange information with the other participants and once the correct answers have been given by the guide, the winning teams will be announced and you will receive your very own ‘Lyonnitude’ certificate.